LONDON — At 24, Linton Harris' soccer career is over. But it's not injury that's caused him to hang up his cleats, it's racism. While playing for the tiny amateur team Wymeswold FC in a local county cup final last Wednesday — a far cry from the glitz and glamour of England's Premier League — Harris claims he was subjected to racist shouts, including monkey noises. Harris was later sent off. "Typical black man, ruining the game," someone was heard to shout from the crowd as he made his way from the field. Harris has scored 46 goals this season, helping Wymeswold win its league. But, he says, he really is quitting. "Oh yeah, definitely, 100 percent — I'm done with playing football altogether," he told NBC News. "It's just getting worse and worse." Stories of players facing abuse from fans, both on the fieldand online, have gained attention in recent weeks. It's unclear whether this is due to an increase in racist abuse around the game, or simply an increase in the attention paid to such incidents. Danny Rose, a Tottenham and England defender, said last week that he is looking forward to retiring so he doesn't have to deal with the abuse and all the politics that surrounds it. "At the minute, how I program myself is that I just think: 'I've got five or six more years left in football and I just can't wait to see the back of it,'" he told the media after a number of black England players were subjected to racist chants from home fans during a game in Montenegro. "Seeing how things are done in the game at the minute, it's just — whatever, isn't it? I just want to get out of it." 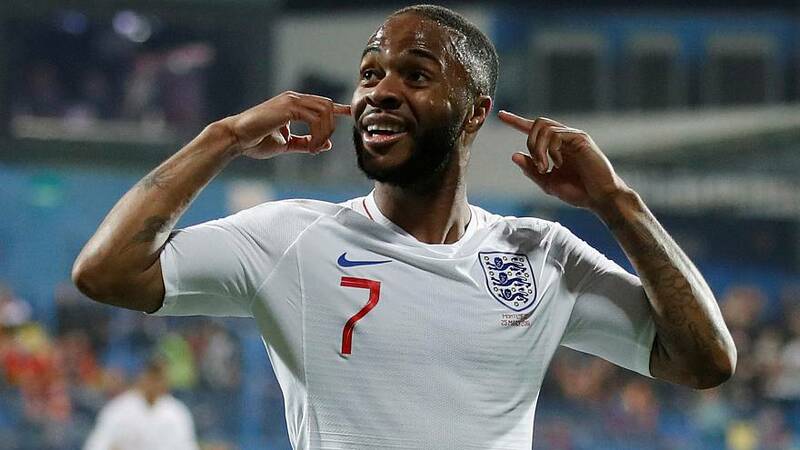 After scoring England's fifth goal in a 5-1 win over Montenegro, Sterling walked toward the fans with his hands to his ears — a direct response to the racist taunting, he later confirmed. Sterling 's talent saw him first rise to prominence as a teenager. He is the subject of consistent scrutiny from the British tabloids, and many have argued that his media treatment is worse than that given to white players of his generation. "Players are being failed by the football authorities," the spokesperson said. "Players are not being protected and it's only a matter of time before they take matters into their own hands and do things like walk off." "In football, I think we operate in what I call a 'white habitus,' which means that apart from the players, the majority of people who watch the game are white," said Jamie Cleland, a British academic at the University of South Australia, who has studied discrimination in sport. "Throughout football history whiteness has been a key part of the game." "In the 1980s, people would throw bananas at players, and what's happening now is very overt monkey chanting such as at the England vs Montenegro game — and social media is creating another outlet for these 'fans,' to use the term broadly, to express these racist thoughts," he added. Cyril Regis was one of the first high-profile black players to make it at the elite level. "As a player, I just made sure I did not crumble from the abuse; that was my way of fighting back," he said in 2002. While Kean's reaction was not dissimilar to Sterling's, the response of his teammates was. Veteran defender Leonardo Bonucci said the blame for any racist taunts was split "50-50" between the fans and Kean himself. Coach Massimiliano Allegri even said Kean "shouldn't have celebrated in that manner." "To win the game would hurt them even more," he said. "They're only trying to get you down."